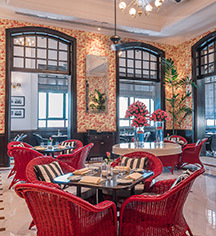 The Strand Hotel in Yangon was one of the first luxury colonial outposts to open in South East Asia. Founded in 1901 by the Sarkies brothers, the architecturally beautiful hotel is a regional landmark. The 32 suite hotel is one of South East Asia’s few grand colonial hotels, and has been a social epicenter for locals and international travelers. A recent renovation project helped restore The Strand Hotel to its former glory, featuring marble and teak wood flooring, ceiling fans, chandeliers and lacquer wood furniture, interspersed with Burmese antiques. The 24-hour bespoke butler service attends to the 32 suites. The Strand Hotel offers state-of-the-art tailored meeting room and conference facilities, and has an experienced team that can cater to ceremony and wedding needs. Offering guests a respite from the city, the hotel is buoyed by the kindness of the Myanmar people, which remaisn the essence of The Strand. 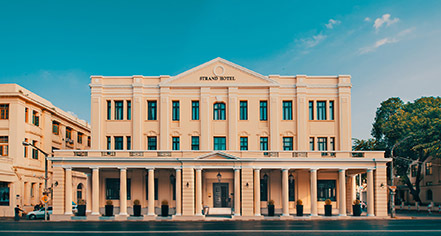 Often regarded as the Grand Dame of Yangon, The Strand Hotel offers guests the opportunity to languor amidst a rich tapestry of past meets present, blending architectural heritage with history, set against a backdrop of Colonial splendor. From the hotel, visitors can explore Yangon’s colonial heritage and local markets by foot or traditional trishaw, then venture further to Yangon’s pagodas and to its picturesque countryside. Iconic sites within easy distance of The Stand Hotel include the historic Sule Pagoda located in the heart of downtown Yangon, and the Bogyoke Aung San Market, a major bazaar known for its colonial architecture. The Strand Hotel, a member of Historic Hotels Worldwide since 2018, dates back to 1901. Prominent luminaries have stayed at The Strand Hotel, from international dignitaries to people of royalty, including President Jimmy Carter and the King of Tonga. Age Requirements: There's no age requirement for check-in. Airport Transportation: An airport shuttle may be arranged through the hotel's concierge, rates at USD 45 per way per car. ATM: Located at this property. Cancellation Policy: Cancellation and prepayment policies vary according to accommodations type. Check what conditions might apply to each option when making your selection. Deposit: Credit card guarantee required. Extra Person Fees: Fees vary. Any additional children or adults are charged USD 60 per night for extra beds. Hotel/Resort Fees & Taxes: Reservations booked under Best Available Rate and most of the resort's packages are subject to a resort fee of 5% tax, and a 10% property service charge. Occupancy Restrictions: Varies by room type. The maximum number of 3 person per room. Payment: Payment is required at time of booking. Visa, MasterCard, American Express, and cash are accepted. Rollaways: Available upon request; 1 extra bed. The Strand Hotel in Yangon was one of the first luxury colonial outposts to open in South East Asia. Founded in 1901 by the Sarkies brothers, the architecturally beautiful hotel is a regional landmark. Learn more about the History of The Strand Hotel .